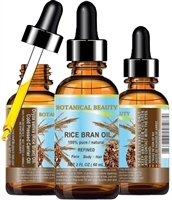 Botanical Beauty RICE BRAN OIL 100% Pure 100% Natural Refined Undiluted Cold Pressed Carrier Oil for Face, Body, Hair, Massage and Nail Care. RICE BRAN OIL 100% Pure 1 Fl. oz - 30 ml. Works wonders in improving skin health. RICE BRAN OIL 100% Pure 2 Fl. oz - 60 ml. RICE BRAN OIL 100% Pure 4 Fl. oz - 120 ml.